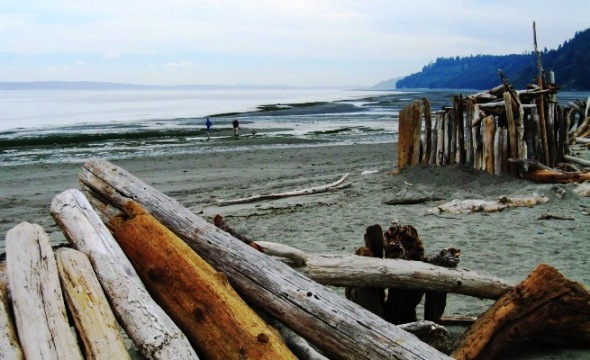 From colorful Poulsbo to the wild Point No Point, you’ll find fun discoveries. I began my adventure at the Kitsap Peninsula Visitor & Convention Bureau in Port Gamble, on the shores of Hood Canal. In the historic M.S. Drew House (c. 1860) office, I found brochures, books and friendly people to help me find my way around the Peninsula. 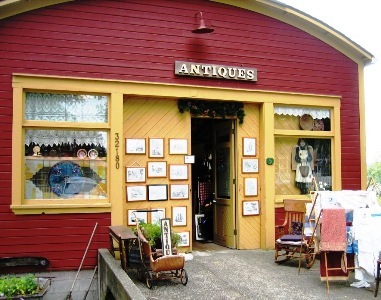 “There’s plenty to see right here in Port Gamble,” says Tourism Development Director Jean Boyle. She describes a charming community with an industrial history and a contemporary arts scene. Annual celebrations include a Renaissance Fair, the North Kitsap Arts and Crafts Festival, car shows, Maritime Music Festival and even a Civil War Reenactment, which I missed by a week. Port Gamble founders Frederick Talbot, A.J. Pope and Captain J.P. Keller voyaged for 171 days from Machias, Maine to the Pacific Northwest, via San Francisco. Their New England heritage is seen in several buildings; most notable is St. Paul’s Episcopal Church, built in 1879 to the same design as the First Congregational Church of East Machias. His sawmill, and others like it, supplied lumber from the surrounding old-growth forest for nations worldwide. A neatly-painted sign in front of a two-story building with a peaked roof identifies it as Franklin Lodge No. 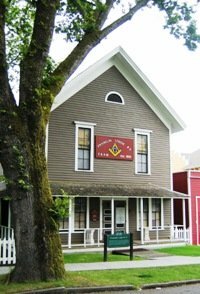 5 (c. 1871), the oldest active Masonic Lodge in Washington state. Its eight original members carried the charter petition by canoe to Steilacoom, the county seat and location of the first post office in Washington Territory. The Morrill S. Pope House (c. 1900), was barged in by its owner after 1929. Supervisor of the mill, Pope had lived in the house at Port Ludlow. Today it houses Friends Antiques. Another historic home is now a full-service floral shop, Rugosa Rose, offering custom floral arrangements and rental items for weddings and other special events. The General Store and Café is still just that, offering clothes, toys and gourmet foods as well as your basic groceries. Popping into the Tea Room at Port Gamble, I'm greeted with pastels and lace and sweet smells highlighted by soft piano music. A specialty of the Tea Room is Chocolate High Tea: a variety of tea sandwiches, Cranberry Pecan or Lemon Scones, a Fresh Fruit Chocolate Fondue, and your choice of tea or French Press Coffee. (Reservations required, please). Jean says frequently the Red Hat Ladies’ groups have events here. For other visitors owner Janis Kelley plans a wall of hats ladies can "borrow" when they come for tea. 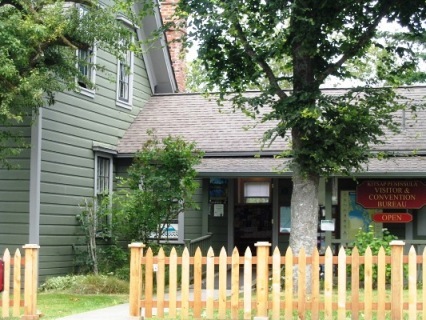 The Tea Room was originally the New York House (c. 1863) or company Guest house, also serving as hospital, office, and home for the town’s resident physician. No one knows exactly how the house was named, but historic documents show that an original resident physician was from New York. Across the street at Mz. Bee Haven Antiques, a historical marker identifies the one-story structure simple as “Market.” Circa 1903, this is where the mill company sold meat and vegetables raised by local farmers. White-bearded Michel Robin, whose wife owns the antiques store, greets us with a distinct French accent. Michel sits penning charming ink drawings of his neighbors’ homes and businesses. He says he doesn’t consider himself an artist. Around the corner the Trading Company offers the work of local artists, including furniture made from the roots and trunks of native Northwest trees such as Douglas Fir and the red-barked Madrona. Houses built in 1873 were originally for married workers. Single men slept in company-owned dormitories and at the company cookhouse. Pope & Talbot Timber Co. closed their sawmill in 1995. Authentically restored and operated by Pope Resources, Port Gamble is the only remaining company-owned mill town on Puget Sound. Today’s population—about 8,500. The town is operated by Olympic Property Group, the real estate management arm of Pope & Talbot. Fulfilling the founding fathers’ long-term commitment, Olympic Property Group maintains the houses, buildings, common lawn areas, cemetery, church, museum and water/sewage treatment plants. 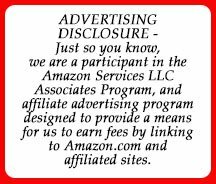 Nothing is privately owned, but homes and shops may be leased. “Are there ghosts here?” I ask. “Oh yes,” Jean says. In their office things move, and sounds are heard upstairs when there’s nobody there, and of course at the cemetery…Buena Vista Cemetery dates back to 1856. Jean says this has to do with the rain coming off the Pacific dumping mostly on the Olympic Mountains. To the west, the Olympic Peninsula gets an average of 400 inches of rainfall a year; Seattle gets an average of 35 inches. But in the San Juan Islands, "the rain comes around the mountains, and Port Gamble gets only about 20 inches" so they're in the Rain Shadow. Most of this rain comes in winter, not on beautiful summer days like today. Jean takes me on a drive south of town on Highway 3. Here’s the Kitsap Memorial State Park, with panoramic views of the bay, rental cabins for families, beach combing, a log hall for weddings, and a steep path to a beach below. We drive country highways flanked on both sides by walls of towering Douglas Fir, broken only by the occasional farm, road crossing or roadside fruit stand selling Bing and Queen Anne—locally called Rainier—cherries. The air smells like a fresh Christmas tree in your living room. A sign coming into Poulsbo announces, “Welcome to Viking Junction.” This is home to the regionally famous Poulsbo Bread Bakery. On such a beautiful day there’s a midday parking challenge, but we’re just in time for our electric boat ride. 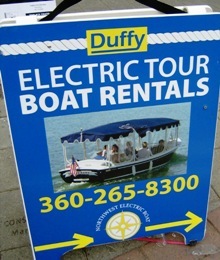 The fiberglass electric boat sports white leather seats, a rotating table with cupholders, heating vents under the seats for cool weather, and a state-of-the-art sound system. A blue canopy provides shade. At the base of pilings—the pier itself disintegrated years ago—seals sunning themselves on logs raise their heads as if to ask, "So, what are you lookin' at?" Two or three swim out to investigate our craft, then swim back to resume their nap. We break open our lunchbox from Mor Mor. The restaurant’s name mean’s “mother’s mother” in Swedish. Manager/owner Laura Nesby says that with as little as 20 minutes notice, a delicious meal can be prepared to go. After the electric boat ride, seal-watching and lunch, Jean and I art-gallery hop, then head north from Poulsbo to explore more of the peninsula. Jean says I must see the 18-acre Farm Kitchen, originally a commercial kitchen for rent, but now the location for gourmet cooking classes and visits from guest chefs. Imagine a gourmet kitchen and a big garden in the middle of the woods! The first Saturday of the month they offer breakfasts featuring yummy fare like stuffed French toast with citrus cream cheese. The Hansville Road takes us all the way up to the top of the Kitsap Peninsula. In addition to Douglas Fir, we spot alder, maple, cedar, madrona and red Japanese maple trees. We pass several lavender farms, fields of purple. “Lavender is in bloom right now,” says Jean. At the top of the peninsula, on a long beach of gray sand containing massive driftwood, is the Point No Point lighthouse. The woods on the point contain lots of hiking trails. There’s an overwhelming abundance of wild life—bald eagles, ospreys, Great Blue Herons. Jean smiles. "Birdwatchers go nuts here." As she speaks, overhead crows harass an eagle in flight. She points out the oldest known eagle's nest in Washington State. Walking trails vein the marshy wetlands. Families enjoy digging for clams and building driftwood lean-tos, just for fun. On a clear day you can see Mount Rainer to the southeast, Mount Baker to the Northeast, and Whidby Island across the water. Another plaque names the PNP Light Station a Registered national Historic Place, c. 1879. 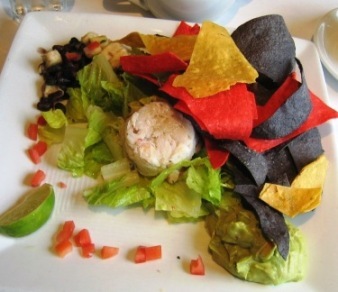 The next day, over a Tortilla Crab Salad at Café Nola in Winslow, Jean tells me that after the first McDonald’s appeared on the Kitsap Peninsula, city fathers decided no more fast food—not even a Starbucks. I’m told that the peninsula has a great transit system; you can take a bus from Winslow all the way to Port Townsend with the Kitsap County transit system. 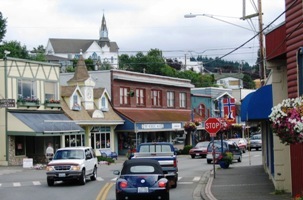 And both Bremerton and Winslow are renovating their downtowns to be more pedestrian-friendly. After an afternoon perusing more art galleries, we dine at Whiskey Creek, a Keyport restaurant reminiscent of a popular road house you'd see in old movies. Here “soup of the day” is steak and potato, and there's Dixieland jazz the first Tuesday of each month. 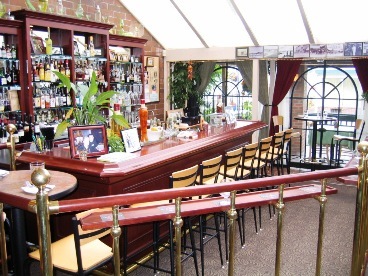 The building opened as the Keyport Mercantile in 1927, but in 1934 became the Keyport Tavern. It’s been an entertainment establishment ever since. The rocks of the fireplace wall came from Whiskey Creek Beach, northwest of Port Angeles. My dinner choice is a regular house speciality: 12-ounce Pepper-seared New York Strip Steak and Halibut Marsala with Artichoke hearts. Other menu options are Homemade Halibut Fish ‘n chips, burgers, chicken, and seafood. And where else could you enjoy an appetizer of beer-steamed clams? Advertising “comfortable prices”, Whiskey Creek takes dinner reservations every day but Friday and Saturday. I tell Jean she has the best job in the world—working in a historic house, photographing and sharing with visitors a magical place. 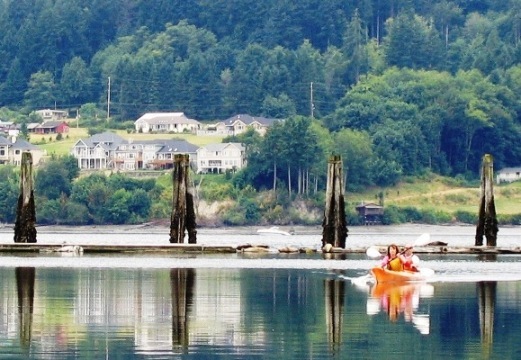 It's easy to see why Washington State's Kitsap Peninsula's official motto is, "Live—Work—Play."